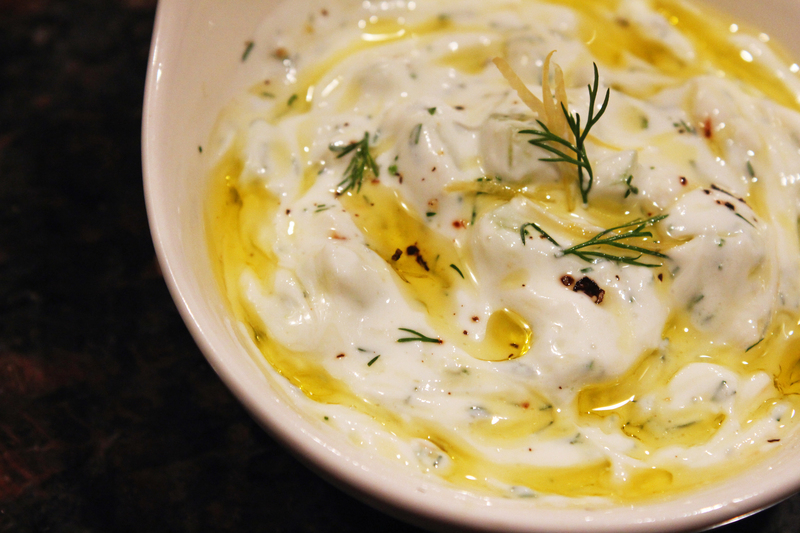 Refreshingly cool and tangy all at once, tzatziki has a lot going for it. 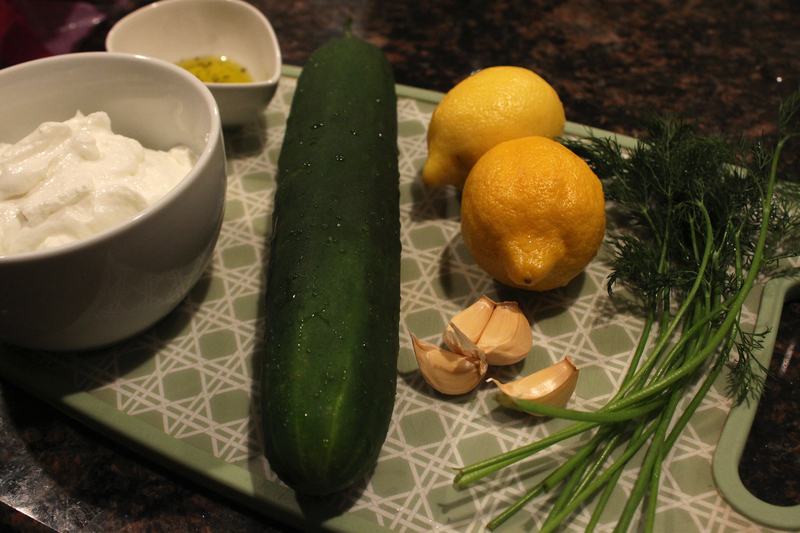 I needed a dipping sauce for some zucchini fritters, and tzatziki sounded like a delicious pairing. I love that this sauce goes with anything- fritters, fish, chicken, veggies, you name it- you can even use it as a marinade (though I have yet to test that). Feel free to dip away guilt-free because all the ingredients are pretty healthy! Whipping up a batch only takes about 10 minutes, which is all good by me. Personally, I found it just a tad too tangy for my taste using 4 cloves of garlic so I recommend using just 2-3 depending on how you like it. Add the two tablespoons of olive oil to the yogurt in a small bowl. 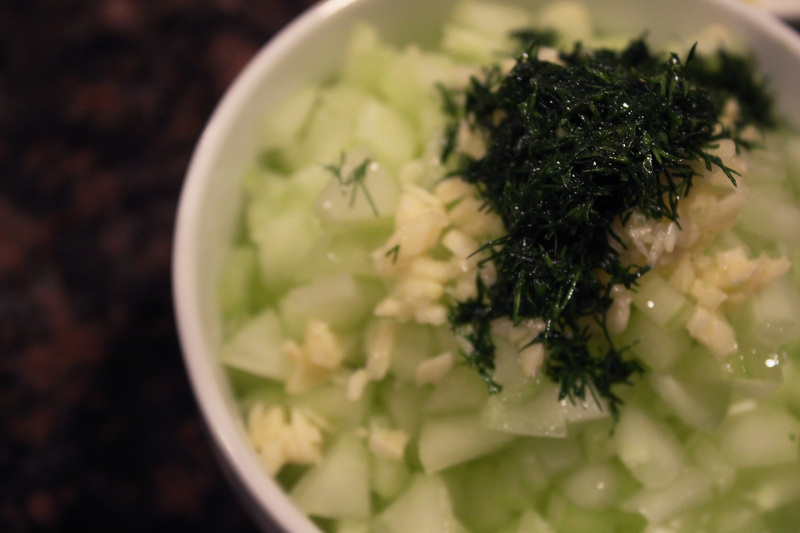 Peel cucumber, then cut in half and remove the seeds. Chop into small pieces and add to yogurt with garlic. Cut lemons, squeeze juice into yogurt mix. Cut dill leaves from stems (I’d rather not chew on large pieces of dill). Chop into fine pieces and add to the bowl. Mix all the ingredients together, then taste to see if you want to add salt and pepper. Refrigerate for about an hour to get all the flavors to really meld together. Serve with olive oil drizzled atop with a few fresh pieces of dill. Tada! Can I pulse everything together, omit or substitute other herbs for dill? It’s uncommon in our place. Thank you! I’ve never tried pulsing it or using other herbs in substitution for dill. Maybe you could try dried dill instead of fresh dill? I can’t think of another herb that has quite the same taste, but if you try something else let me know! It looks so delicious! I love the olive oil swirl on top.